Your putter is like a lover. It smiles across the room at you – you fall in love and it can do no wrong. When you find the right one you wonder how you ever lived without it. Then one day, it betrays you. It will make you angrier than any other club in your bag. One sad day you may even choose to part ways. Putter technology has come a long way, and if you can’t find something that works for you then you are not looking very hard. The first thing to figure out is are you a blade guy or a mallet guy? They both come with advantages and disadvantages. 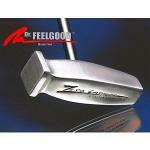 A real feel player will prefer the blade while those looking for consistency and “nerve proof” will opt for a mallet. And there are many that are somewhere in between. 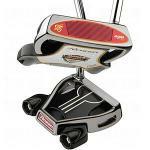 Blade Putters – I recommend these type of putters for those golfers that use the open-the-gate close-the-gate type of putting stroke. There are so many to choose from. The more expensive ones are going to have premier balancing, tremendous feel, and more feedback in your hands. 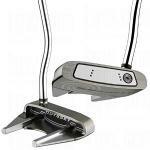 I really like the Scotty Cameron Titleist Studio Select Newport 2. This putter sets up beautifully with good alignment aids and has a feel like no other. My less expensive choice is the Odyssey White Hot Tour 1 putter. 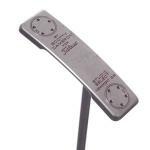 Mallet Putter – The Odyssey Two Ball Putter changed the putter world forever and has been imitated by every brand. The reason is because it is very forgiving and has a large MOI to help miss hit putts still go straight. 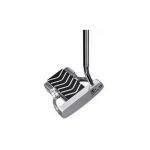 I like this putter but I prefer some straight lines on my putter like the Odyssey 2 Ball Lined putter. Small Mallets and Hybrids – There are some cool smaller mallets that I’ve seen a lot of good players moving too. These allow you to have the best of both worlds – feel and forgiveness. My favorite of these is the Odyssey White Ice Rossie. A cool hybrid of both styles is the Odyssey White Hot XG 2-ball Putter Blade Style. What? You’ve never seen a putter worth $5,000? Well, have you ever seen one that was blessed by the Dali Lama? I haven’t, either. But I’m thinking it should be, at least before I take out a mortgage on my house to buy it. This is a strange-looking putter. Odyssey has taken a blade putter head and attached the putter shaft to the back of it. What the heck are they thinking? This Never Compromise X Ray Beta "Blade" putter is not exactly a blade. Perhaps they are trying to appeal to us purists who are not quite ready to give up our traditional blades yet. If you are ready, this is a good way to go. 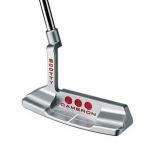 This is another beautiful Scotty Cameron Blade putter. You won't find a better feeling putter. 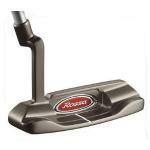 It is very similar to the Newport, with the same putter head, only the neck is shorter and flared. This Never Compromise Mallet putter has a huge MOI. They achieve this by using an extremely lightweight insert and putting all the meat in the rear and perimeter. I've always liked this Rossie-style putter because it's smaller than those typical gargantuan mallets. I also really like the lines on the putter head for alignment. Most mallet putters don't have good alignment aids. It would seem Odyssey invented insert putters. This newest White Ice is the result of soliciting feedback from the tour pros. The pros are looking for responsiveness, resiliency, and consistency, and that is what Odyssey has very effectively constructed. "Welcome to the penthouse suite; please come in and enjoy the view." ‘Tis the season. Look, you know Hubby is going to come to the plate with diamond necklace and earrings. I've got the male equivalent right here. Here's TaylorMade Rossa Core Classic Lambeau putter. It's your classic heel shafted blade design. I'm not big on the huge mallet style putters, but prefer the blade style putter for its feel and feedback. 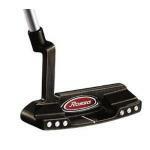 This is a tour quality putter that has a tremendous feel and a traditional look. Okay folks, this isn't kid stuff anymore -- you've stumbled across a beautiful tool designed for real players. Drum roll please??? It's Odyssey's White Hot Tour #1. They say "imitation is the purest form of flattery." 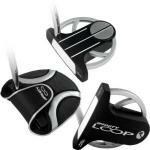 If this is the case, then Odyssey Golf should be flattered by this Affinity Loop .001 Putter. It looks like a version of Odyssey's famous 2-ball putters. Here is a small mallet putter. It is from Odyssey's Crimson Series, which is very easy to distinguish with the red (or crimson) colored insert. The mallet has a slant neck hosel and is face balanced with a full shaft offset. This heel shafted mallet is very similar to the one that Phil Mickelson has played with on the PGA tour. This blade style putter is very similar to the Odyssey White Hot Black #2 that I've been playing with for years, only the Hot Tour series takes it to the next level. 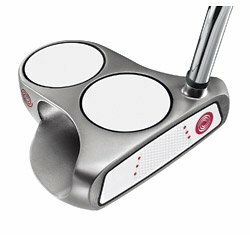 The Black Series #3 Putter is a sleek mallet. 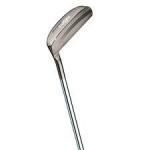 It is face-balanced with a double bend shaft and a full shaft offset. These Odyssey Black Series putters are beautiful creations. They are designed for more advanced players. This putter looks like the fangs of a cobra. These Odyssey Black Series i putters are beautiful creations. They are designed for more advanced players. 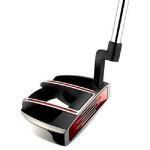 This putter is the ever popular 2-Ball putter, only Odyssey has sent the Black i to charm school. These Odyssey Black Series i putters are beautiful creations. These are designed for more advanced players. "Scotty, I need more power!" 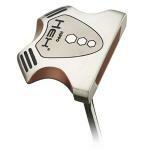 This putter looks just like the spaceship from the TV show Star Trek. Odyssey dropped the ball with the name. They should have called it the White Hot XG SS Enterprise. Is a tomato a fruit or a vegetable? Is this putter a blade or a mallet? These are the questions I will address in the blog.